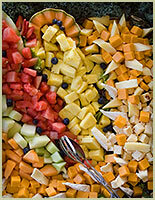 Including Strawberries, Pineapples, Melons, Kiwi, Orange Wedges, and Red and Green Grapes. Served with Honey Yogurt Sauce OR Chocolate Fondue. A Grand Display of Homemade Breads and a Variety of Domestic and Imported Cheeses Presented Display Style with Gourmet Crackers. Including Broccoli, Mushrooms, Cauliflower, Carrots, Cherry Tomatoes, Jicama, Zucchini, etc. Served with an Assortment of Fresh Baked Rolls and Condiment Sauces. Also served with Barbecued Meatballs, Spanakopita Triangles, Popcorn Shrimp and Egg Rolls (Shrimp, Chicken, or Vegetarian). Roasted Pork Loin with honey orange mustard. 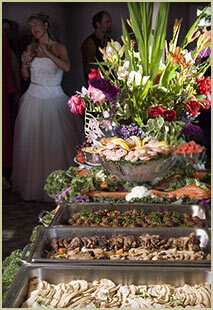 Can be presented buffet style or served to individual tables.